As the world awaits the upcoming summit between President Donald Trump and North Korean dictator Kim Jong Un, South Korea’s President Moon Jae-in has sent conflicting signals to the United States. Doubts have now been raised about whether Moon’s left-leaning administration is committed to keeping U.S. troops on the Korean Peninsula and supporting U.S. efforts to disarm a nuclearized Kim regime. The controversy started on April 30 when Foreign Affairs magazine published an article by Moon Chung-in, a Yonsei University professor and a special adviser to the South Korean president on unification, foreign, and national security affairs, in which he wrote that U.S. military forces in South Korea would probably not be needed anymore once a peace treaty is signed. The U.S. military presence is a highly sensitive topic both in terms of South Korea’s domestic politics and also its alliance with the United States. While a significant segment on the left of South Korea’s domestic politics desires a reduction or removal, President Moon Jae-in, who is from a left-leaning party, still publicly supports the stationing of U.S. troops in the country. The uproar over the article was such that Moon Chung-in soon backtracked from the statement and said that he still supports the U.S. troop presence. South Korea’s Blue House also had to dispatch its national security adviser, Chung Eui-Yong, to the United States to meet with his U.S. counterpart, John Bolton, on May 4 and publicly reject the talk of a possible reduction of U.S. troops. Chung’s visit, however, ironically coincided with a trip by Moon Chung-in to the United States. 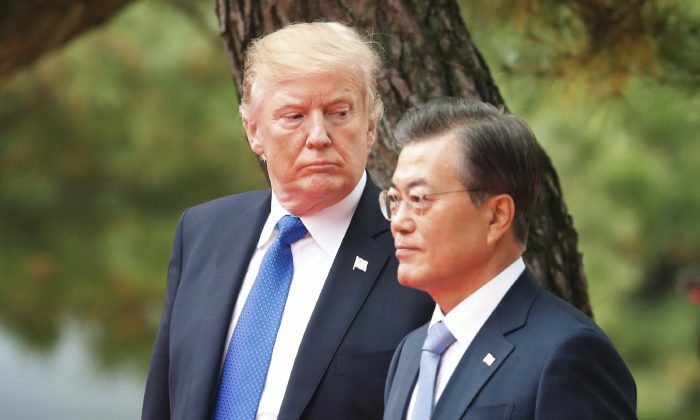 Despite insisting that he’s not speaking in any official capacity nor representing the Blue House’s views, Moon’s title of special adviser and the fact that he’s a close friend of President Moon Jae-in meant that his speeches in the United States were followed closely by Korean and international media. Moon Chung-in’s remarks are in sharp contrast to South Korea’s official diplomatic stance, which supports the U.S. position that North Korea must commit to denuclearization first in order for a peace treaty to come to fruition. “Peace and stability in East Asia depend on North Korea’s complete denuclearization. We hope that U.S.–North Korea summit will be a concrete step toward such aspiration,“ said Cho Yoon-je, ambassador of South Korea to the United States, on May 7 at an event at the Center for Strategic and International Studies in Washington. Observers say that Moon Chung-in’s statement is indicative of the views of many on the political left in South Korea, who downplay the North Korean regime’s aggression while at the same time treating the U.S. alliance as an obstacle to the country’s reconciliation with the North. Moon’s statement is indicative of the views of many on the political left in South Korea, who downplay the North Korean regime’s aggression. 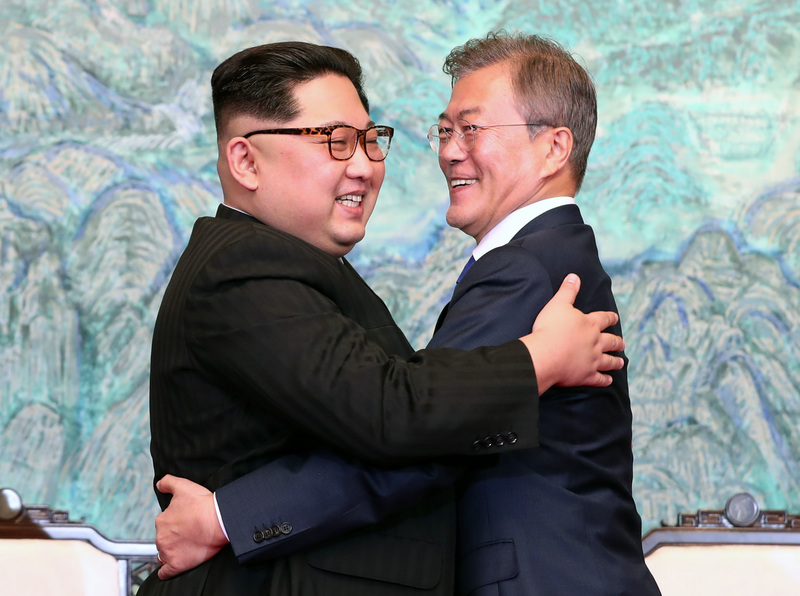 “Moon is obviously putting the onus of returning to subsidizing Kim Jong Un while the dictator lies and continues to advance his nuclear posture review on Trump; that is, Trump had better give Kim whatever he calls for, otherwise the summit will be a failure and Kim will return to his old, ‘paranoid’ ways of threatening nuclear war,” said Sung-Yoon Lee, a Korean studies professor at the Fletcher School of Law and Diplomacy at Tufts University. Moon Chung-in, an outspoken voice of South Korea’s political left, is no stranger to controversy and has several times ignited a furor with remarks he made in the United States. In June 2017, for instance, he suggested that a U.S. aircraft carrier should be “kept away” from the Korean Peninsula so as to reduce tensions with North Korea’s Kim regime. Moon Chung-in’s title of “special adviser” to the president is an honorific that comes with no official power and earns him no payment from the government except for his travel costs. Still, observers question whether President Moon Jae-in’s appointment of such a controversial adviser sends a political signal. “If he still holds the position as a senior adviser to the president, I would assume so,” said Victor Cha, a Korea expert at the Center for Strategic and International Studies, in response to a question about whether the controversial professor actually speaks on behalf of President Moon. U.S. diplomats and military planners such as Defense Secretary Gen. James Mattis have repeatedly said that “there is no wedge” between the United States and South Korea and that the security alliance between the two countries, which are tied by a mutual defense treaty signed in 1953, remains strong.